A: It’s how you spell what having a spelling category is on Jeopardy!. See, there’s no way to even make a spelling “answer” sound legitimate. Tonight, it cost us several clues and the first-round Daily Double. 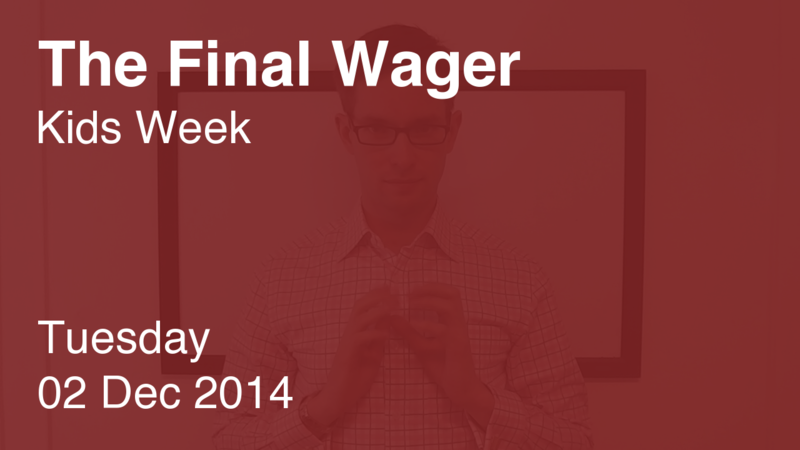 Let’s skip The Final Wager for now and look at tonight’s Penultimate Wager. 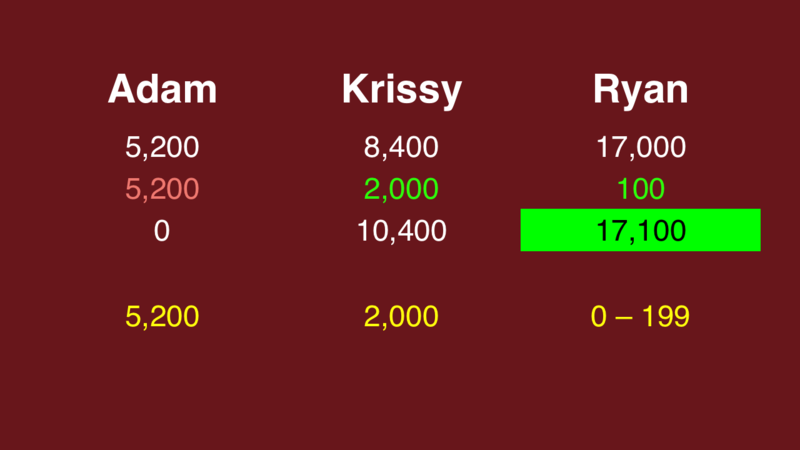 Ryan had it with the game nearly locked up. It’s clear he has to wager at least $201 to get the lock. He wagered $400, got it right, and sewed up his victory. Some quick math yielded a smart play. Nice work, Ryan! Now, for some practice: What would you say is his maximum acceptable wager in this situation? My thoughts are below. 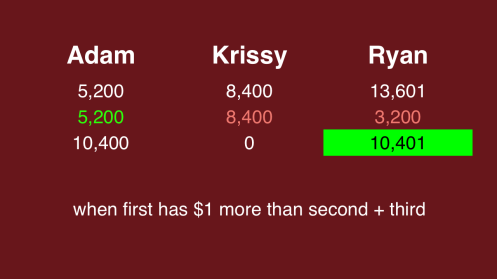 Now, as for our players’ Final Wagers, Ryan needs to stay small ($199 at most) while Krissy has Adam in a “crush” situation – Adam has less than 2/3 of Krissy’s score. Remember what I said last night about showing the adults a thing or two? Wow! (2) remain above the sum of second + third (≥$13,601), which keeps Adam out of contention. The most he can wager, therefore, is $2,999. Who is Queen Elizabeth II? The URL in your “notification” email is wrong. It looks like you have “12/03” in the date in the middle part that should be “12/02”. Thanks for pointing that out – I need to figure out how to disable the date from the URL in the email. It can be quite a pain when I publish around midnight! Krissy studied your techniques and will be happy to hear you approve of her wager! Great!! Glad she found them useful. Congrats – you must be very proud!